This entry was posted on January 19, 2016 by Jessica Anderson. Even though we are now in the middle of January, I really enjoy looking back over the year to see what trials we have overcome and accomplishments we can celebrate as a company. Here's a look at the 2015 year in review. 2015 Retail Website of the Year from the ARA. If you have ever launched an ecommerce website, you know that no amount of planning and testing can truly prepare you for when your site goes live. Unfortunately we started the year on a down note, as we had just launched our new website in Oct 2014 and had many, many unplanned problems. Even though the website had improved attributes over our previous site, we had challenges with our user experience, including customers unable to place orders, shipping issues, and problems with browsers, especially Internet Explorer. Thanks to the tireless work of our developer Ben C., over the course of the year the bugs were squashed and the website performance improved. Thanks to the hard work, patience and perseverance of our staff, our site now looks great, works well, and gets positive reviews from our customers. For the second time in our company's history, we receive the Awards and Recognition Association (ARA) Best Retailer Website (photo above right). 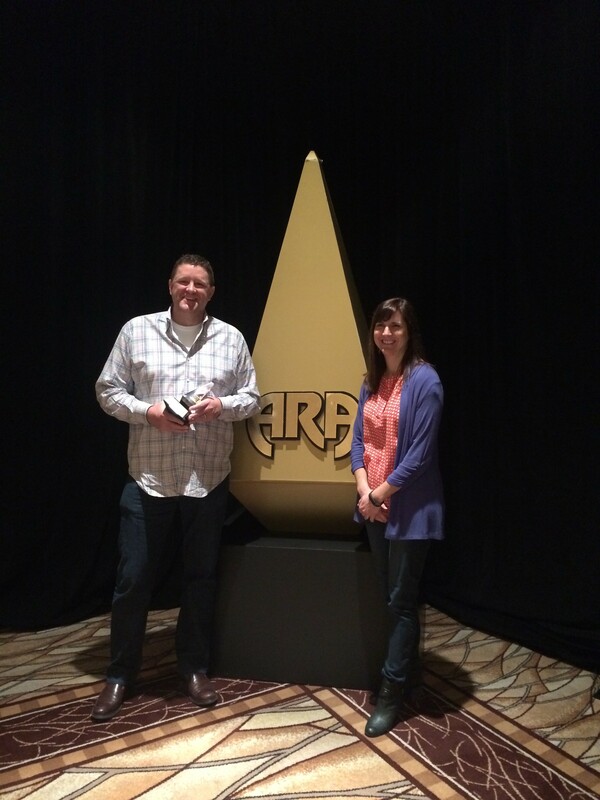 Even as we struggled with bugs, our website was honored by the ARA for it's innovation. What an awesome achievement and something to celebrate! 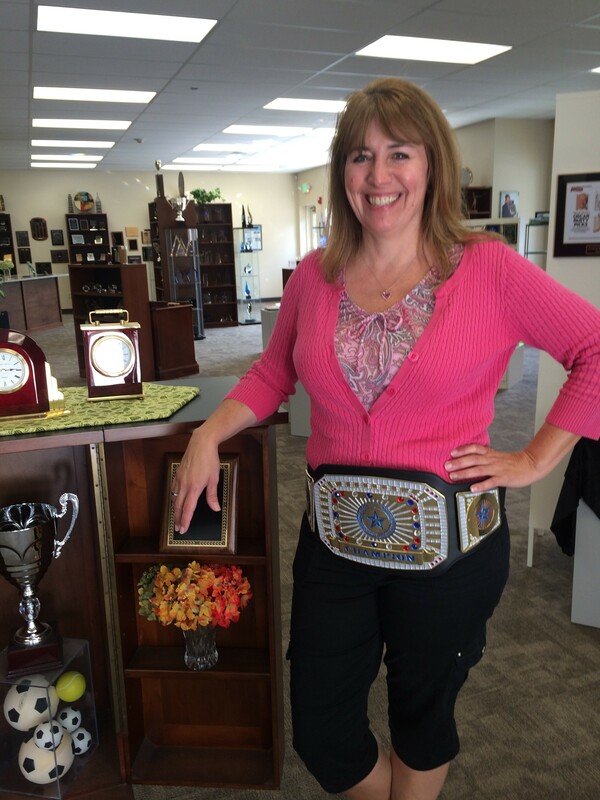 Margene models our Championship Belt! 2015 was the year for new products. We introduced new crystal golf awards, engraved glassware, including wine glasses and beer steins, and epic championship belts. We now offer full color sublimated products, which is a new technology for us. It's been really fun to create customized awards in full color for our customers! It's amazing to me the range of different product we can now make with our sublimation system, such as photo panels, rock tiles, name badges, clipboards, full color plaques, and acrylic awards with photos. What an innovative and creative way to make meaningful awards and gifts! One other piece of new equipment we purchased is an Epilog laser. Our two laser engravers Laurie W and Lori N were over the moon with this new piece of state-of-the-art equipment! Paul with his 10 year award. 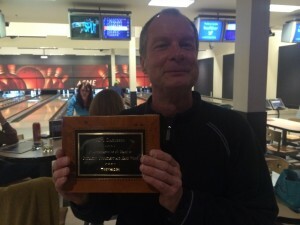 The Trophies2Go Team enjoyed two teambuilding events - bowling in May, and our annual holiday party with white elephant gift exchange in December. Both events were well attended and enjoyed by our staff. One anniversary to celebrate was our engraver extraordinaire Paul's 10th year with our company. Paul is an awesome co-worker; he's dependable and even-keeled. He is extremely meticulous and thorough with his craft, creating stunning engraving that customers love. That's our year in a nutshell! 2015 is definitely a year to remember. Lessons learned include when challenges come your way, stay committed to work at it a day at a time, and eventually perseverance wins out. Wishing you and yours a great 2016!